Corals are living, breathing animals which create reef habitats critical to wildlife and humans alike, however climate change is having a devastating impact. As our ocean’s waters warm many corals become stressed, lose their colour and are at risk of dying – a process known as coral bleaching. Hoping to uncover the extent of the issue closer to home, ZSL's EDGE Fellow Ahmed Basheer has been in the Maldives investigating coral bleaching on two particularly rare species and along the way has discovered one frogfish trying to adapt to the changes. EDGE Fellowships help early conservationists build conservation capacity in different parts of the world and fund fellows like me to study and conserve Evolutionarily Distinct and Globally Endangered (EDGE) species. The Fellowship is a tremendous opportunity, enabling me to dive deep into the field of conservation and focus on two EDGE coral species; the Elephant skin coral (Pachyseris rugosa) and the Pearl bubble coral (Physogyra lichtensteini). These two species play a vital role in building the foundation and structure of reefs (for this reason they are commonly known as reef building corals, or scleractinian). It’s now well known that a large proportion (75% to be exact) of the world's coral reefs are threatened. They are exposed to various threats such as inadequate waste management and poorly planned coastal development which have deteriorated the health of the corals that build the reefs. In addition, climate change exacerbated by human activities is causing ocean acidification which further worsens the health of reefs. Algae lives within tiny polyps in the coral’s tissue which gives them their colour and provides the majority of their food through phostosynthesis. However, warming waters cause corals to become stressed and the algae to leave, bleaching the coral white. If the water temperature remains high for a long period the corals will die off. Being a Maldivian, these effects are a personal concern for me. The Maldives contains around 3% of the world's coral reefs and all islands are less than 3m above sea level. We are highly reliant on reefs for our livelihoods and as coastal protection. 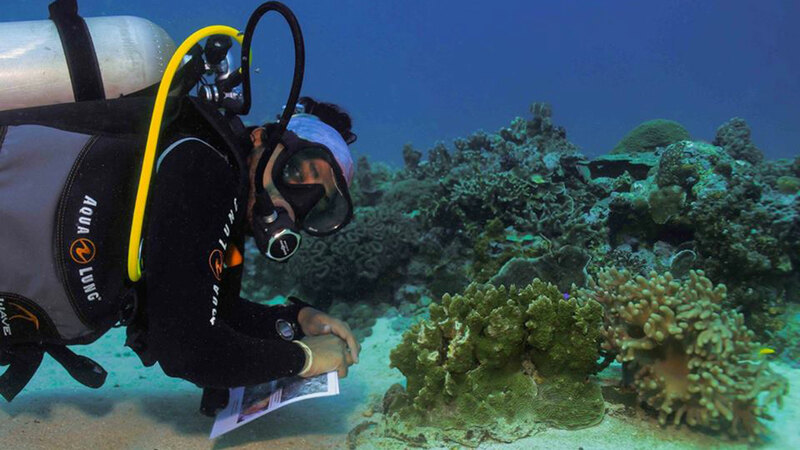 Therefore, managing and conserving coral reefs in a healthy and sustainable manner is of utmost importance to us. The existence of healthy reefs are critical to the future survival of us Maldivians. This is one of the reasons why I wanted to direct my passion for the ocean towards marine conservation. You may have heard about the 2016 global coral bleaching event. This event has been disastrous for many reef systems around the world, with some being subject to wide-scale bleaching and subsequent mortality. This was sad news to us and as part of my work for IUCN Maldives we were keen to find out how our reefs were fairing. I was lucky enough to take part in a two week expedition to monitor how the warmer waters were affecting our reefs, which I loved. We worked in and around North Ari Atoll (one of the 26 atolls in the Maldives made up of small islands and reefs) and I found my two EDGE coral species were very common on the 12 sites we surveyed. However, the extent of bleaching was heartbreaking. I saw that the bleaching had affected my two EDGE species, impacting the elephant skin more than pearl bubble. These species are very important to the reef's foundations but bleach easily in the Maldives. The most exciting, yet saddening part of the expedition for me was when I came across a very interesting frogfish. Frogfish can be found in a range of colours from yellow, red or even black and have the ability to change their colour to camouflage themselves against their chosen background while they wait patiently for their prey to swim by. This particular one, a warty frogfish (Antennarius maculatus) was hard to recognize at first as it had settled on a bleached coral and had turned completely white to camouflage itself. I got very excited as I have never seen a white frogfish before! Once we were back on the boat, the other researchers and I talked about how it might have changed the color to adapt to the environment. Everyone was very interested because nobody had ever seen a frogfish change colour to camouflage against a bleached coral. My colleagues and I started doing some research about their adaptation, and even published our chance encounter in the Journal Coral Reefs - “Extreme white coloration of frogfish Antennarius maculatus due to coral bleaching event”. Coral bleaching is a natural process, however with human-induced climate change thrown into the mix our seas are becoming warmer, more acidic and our sea levels are rising faster than corals can adapt to cope. The significance of the white frog fish is both a good news and bad news story. It’s encouraging to see that life in the ocean can adapt to changing conditions, but also sad that this fish should have the need to camouflage against a bleached coral in the first place. ZSL's EDGE of Existence Programme is celebrating its 10 year anniversary!